December is a month full of celebration . My birthday fall in the month of December. But this is not the only celebration we do in end of the year. Follow by Christmas and jumping into new year. Is always a month have lots of celebration . I make this cake first for my own birthday. The interesting thing is , I have started my baking "business" ( cant really consider as full business but I bake by order from friends who want cake for any occasion ) . So my friends order a cake from me for my birthday . Wahahaha!! Reason given - " we cant find a cake that you will like. So we will pay you to bake a cake for your birthday party. " Well I did not complain , afterall I got to experiment and get to pay for it. In Australia it does has a culture to bring your own cake to the office and celebrate with your colleague. ( Do not ask me why, I can not figure out the reason as well ). 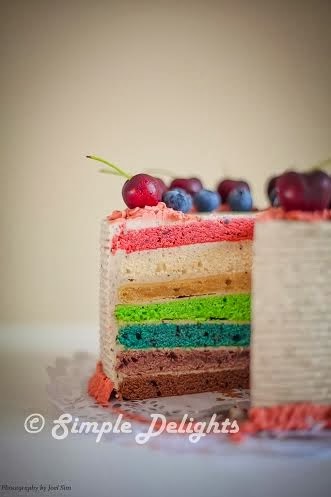 So I treat this as an honor and there was this cake I would always love to try out - Rainbow cake !!!! I look for the recipe and mostly is all using coloring. NOPE this is not what I prefer my cake to be. So when I find this ->Peng's Kitchen. I am happy to use this recipe and adapt to the ingredients I can find in Australia. Hereby this is the cake I have make and right after my birthday I have an order from a lovely husband who want a colourful cake for his lovely wife. So I did make the 2nd Rainbow cake and improve a lot from my plain decoration version. 3. Mixed the vanilla, milk and yogurt well in a bowl. 4. Sifted the flour with baking powder and baking soda. 5. Add in the liquid ( step 3) and flour alternately in step 2 . Be careful not to over mix. 7. Divide the cake mixture into 7 portion by having 3/4 cup batter into separate bowls and mix in natural coloring into each bowl. 8. Pour the batter into a 7" round pan and bake for 15min or until the toothpick inserted come out clean. 9. Take out the cake leave it to cool (5min) and use a thin knife go arout and the cake pan and have the cake out and cool on rack. I bake 2 cake at one time as I happen to have 2 mould. It help to shorten the time of the baking. After finished all the baking , make sure the cake cool down before frosting. 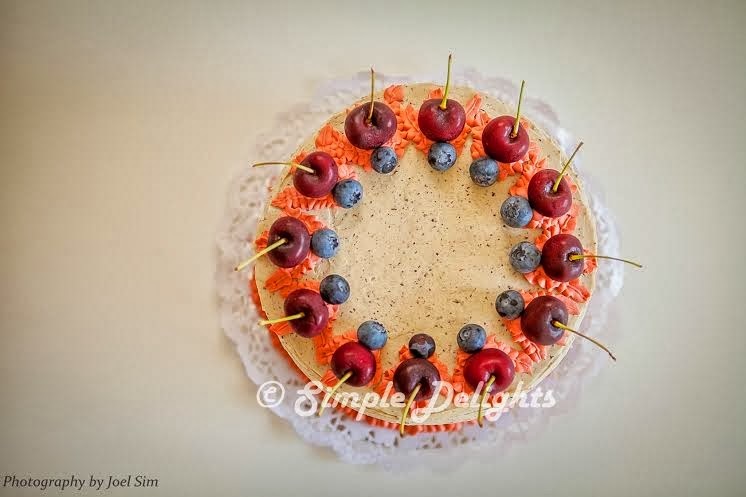 Decorate the cake with your favourite fruit , I used cheeries & blueberry . Simply love the look of this cake and the height of it. The cake did bring a "wow" factor after one slice was being cut out. However the cake is not as moist and soft as I would love to. I will try other cake base and see what it will bring next time when I bake this again . Rainbow always mean something speacial to my heart, as it remember GOD's promise for me and my dear one on our wedding. At time things get tough and life is not always easy , I bake this cake to remind myself GOD's goodness in this season and trust HIM will bring a more of HIM 2014 in our life again! Happy New YEAR !!! May GOD blessings fall upon you and the love one in 2014 . You will be a great blessings to those around you . I am submitting this post to Baby Sumo's Christmas Recipes Collection 2013 event which is hosted by Baby Sumo of Eat Your Heart Out. Remember every cloud has silver lining and rainbow always come after storm !! P/S : The picture in this blog is taken by a talented brother. Really love how it make the cake looks so like magazine picture. What a gorgeous cake! Love that you used natural coloring for this. Thanks Yen, is my pleasure to be able to join the Christmas baking event. Love the theme and enjoy learning from others who have bake and cook during the festive season. 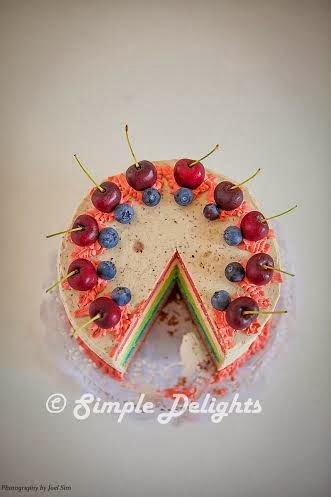 I bake a rainbow cake too yesterday! I love that u uses all natural color. They are awesome!